Throughout my life, I have struggled to find my voice. Not my talking voice. I found that right out of the womb. Just ask my mother. The voice I’m referring to is that mystical creature artist’s talk about when they are trying to discover what distinguishes them from the crowd. No one really knows what it means or how it can be found, but I have not found mine yet. Maybe it’s hiding under the bed. The volumes of journals and notebooks I have filled over the years are bursting with words that were obviously written by someone with multiple personality disorder. Maybe that is just who I am, a girl with many voices. One minute I write about a first memory when my father was in the habit of trying to perfect lemon meringue pie. He would whip up meringue, and then cover my face with the soft peaks, creating a Santa-like beard on a tiny, almost in-the-buff three year old. I love that memory as much as I love lemon meringue pie. The next minute, I write about how unpleasant it feels to be in my own skin sometimes, because I am misplaced even though I feel bold for the first time in my life. Getting laid off in your early thirties just as you are finishing school can do that to a girl. I anticipate that these thoughts will eventually wane, and underneath I will find me again. I accept being flawed, just as long as I also feel daring enough to allow my many voices to be heard. 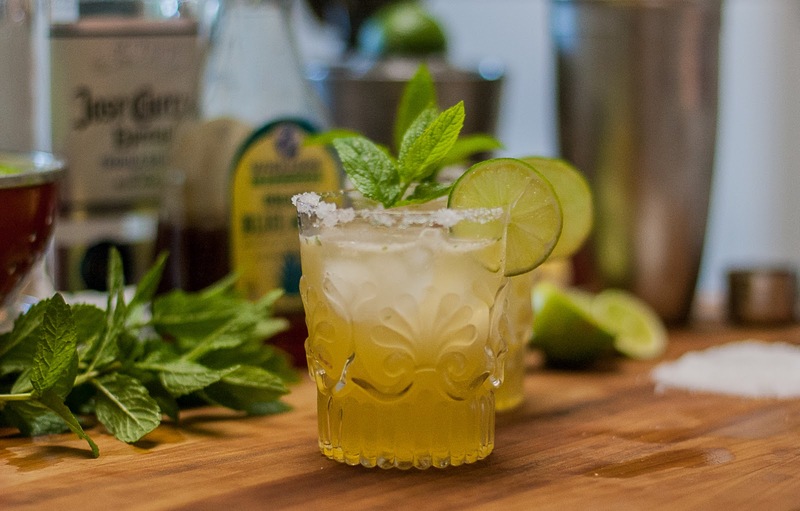 When I’m feeling this way I often rely on a trusty side kick, a classic margarita with a little mojito twist of fresh mint. This is not to say I get drunk to hide my feelings. Oh no. Okay, maybe sometimes. But I do enjoy a perfectly crafted cocktail after a long day of trying to be a housewife, rewriting my resume, applying for jobs, and being creative in the kitchen. I made this margarita based on a recipe from a wonderful book called The Drunken Botanist by Amy Stewart. The book was given to me by a dear old friend who knows my many sides very well, and it is filled with wit and wisdom as well as many facts about the plants that make our fine spirits. Ms. Stewart is certainly a kindred spirit, and if you love learning while reading a great book as much as I do, I am sure you will have affection for her too. Rub the edge of each old-fashioned glass with a wedge of lime and dip in to the salt. In a cocktail shaker, shake all of the ingredients except the slice of lime vigorously with ice. Strain over the prepared glasses (to keep big chunks of mint from falling in to the glass). Garnish with slice of lime and a sprig of mint. Beautiful margarita! Definitely want to try this classic recipe. I love your voice(s), and your unique perspective (camera in hand) on the world. And I happen to love a good margarita. 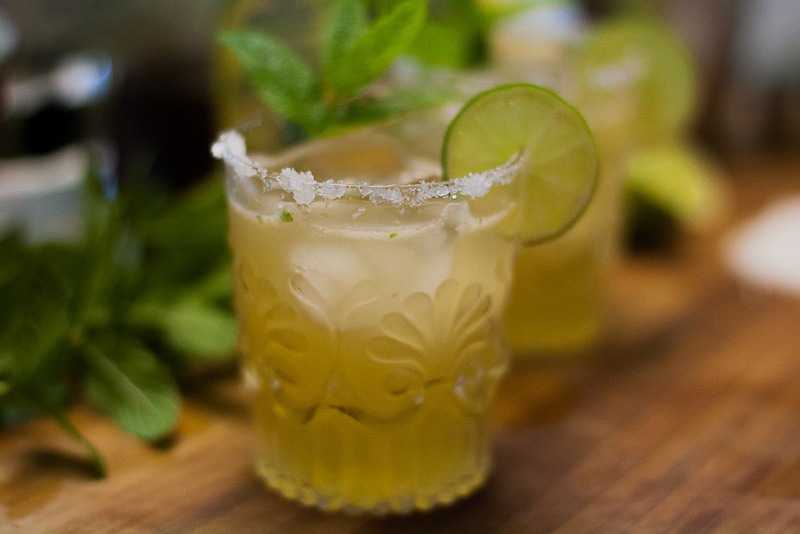 This looks like a cross between margarita and mojito ... mmm. I think we all have lots of different "voices" in us. This drink sounds amazing because I love margaritas and mojitos. Do you know, this is just what I need right now. Unfortunately I don't have any of the ingredients (but I am going shopping for them tomorrow). Love the addition of mint to the margarita...what a great idea!